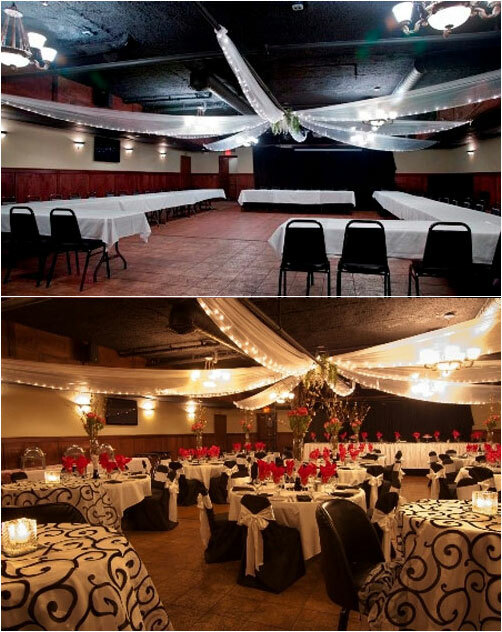 Take a look at how Design's by Lisa transformed the banquet room at the Maple Tavern in Maple Grove, MN. Wedding guests where shocked and amazed when they entered this beautiful room. While the first photo was taken after the ceiling decor was added, you can see how table and chair covers, beautiful centerpieces, and other decor add elegance. Ceiling Decor - Tulle, lighting, & hanging wisteria. Chandelier Available for extra fee.